wedding flowers | Welcome to the World of Wonderful Weddings! What is Your Favorite Flower for June? June Flowers are in full bloom! June brings so many wonderful flowers for sharing at Weddings! The Davis Event Group has created a poll so that you may vote on Your Favorite Wedding Flower! June Wedding Season is in Full Swing! That means that many brides from all over the country are getting ready for their dream June Wedding! There are so many wonderful wedding ideas that can be incorporated into your special day. Flowers are often chosen according to the season to bring out the beauty and splendor of June weddings. 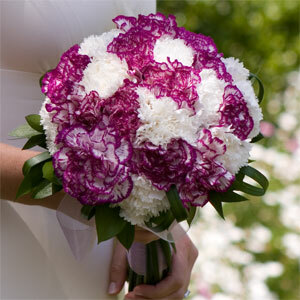 Here is a photo of a beautiful bouquet of purple and white carnations! The Davis Event Group can help make your Wedding Day that much more memorable by helping you select the perfect flower arrangement for your special day! Be sure to visit our website and make sure to ask one of our consultants about flower arrangements!